Archbishop Amil Nona of Mosul presided at the liturgy at St. Paul’s Chaldean Church which people reached on foot after a curfew on cars and other traffic was imposed amid continuing security alerts. But a full curfew the day before meant that the Holy Thursday Mass was canceled, and, as in previous years, the Easter Vigil service had to be scrapped because of safety fears after dark. 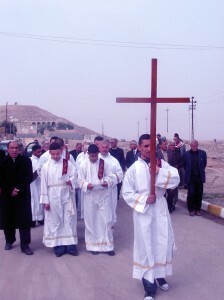 Archbishop Warda said, “People in Mosul really encouraged Archbishop Amil by their willingness to participate in the service on Good Friday in Mosul. “The service is always very uplifting and special in the life of the community. Mosul, which is in north-west Iraq, has witnessed some of the country’s worst persecution against Christians, with random kidnappings, murders and repeated efforts by militants to scare the faithful into a mass exodus from the city. 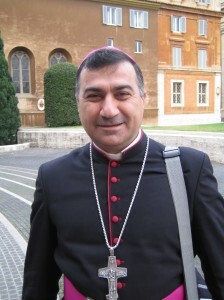 Archbishop Warda’s comments come amid reports of violence close to churches in Baghdad over Easter. On Easter Sunday, April 24th, parishioners reportedly had a near miss when they were evacuated from the capital’s Sacred Heart Catholic Church just before an explosive went off. Nearby, faithful huddled inside the nearby Mary the Virgin Catholic Church while outside four police officers were injured in a firefight with gunmen. In another sign of the faithful’s defiance, Church leaders at Baghdad’s Our Lady of Salvation Syrian Catholic Cathedral reported that so many people came for Easter Day Mass that the number of services was increased from one to three. The cathedral was the scene of a siege during Sunday Mass on October 31st, when 58 people were killed – including two priests – and more than 70 were injured. Archbishop Warda said that in his Easter Message he had appealed to rival political factions to seek “reconciliation” with the help of the Church. The continuing violence against Christians and political uncertainty is being blamed for the widespread emigration of faithful from Iraq. Christians have plummeted from nearly a million to less than 200,000 within a decade.